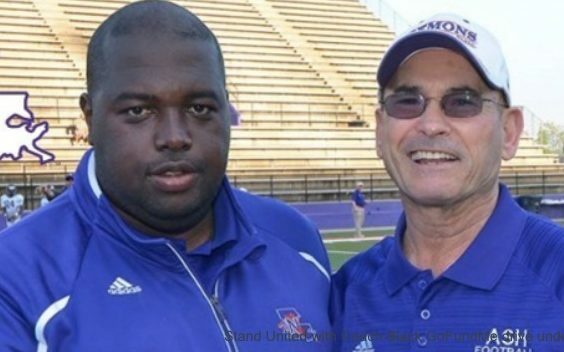 NATCHITOCHES – Harris Wilson Jr., better known in Natchitoches and around Northwestern State University as Coach Black, will be honored with a reception to recognize his heroics in rescuing his niece from his burning home last month. The devastating fire destroyed nearly everything in the family’s home, but there were no serious injuries. Wilson made it outside, then realizing his mother and niece were not out of the house, went back in. They made a narrow escape through a window at the back of the house. Sponsored by Modern Woodmen of America, the reception will take place from 6-8 p.m. Tuesday, Aug. 29 in the Stroud Room of the NSU Field House. The public is invited to attend. At the reception, Modern Woodmen’s Natchitoches chapter will award Coach Black with a $100 grant to present to the Boys’ and Girls’ Club, the charitable organization of his choice. Since the fire, the Natchitoches community poured out support for the family by contributing to a GoFundMe account managed by the Demons Unlimited Foundation. Athletics administrators and coaches gathered clothing and other items for the family. Wilson has been a fixture with NSU Athletics for more than 20 years. He was given his nickname Coach Black by his father when he was a small child and for most of his adult life, he has played a role in inspiring coaches, administrators and student-athletes at Northwestern State. Contributions can still be made to the GoFundMe Account by clicking on the following link: https://www.gofundme.com/stand-united-with-coach-black. For additional information, contact Dr. Haley Taitano, Associate Athletic Director for External Affairs/Senior Woman Administrator, at blounth@nsula.edu via email, or by telephone at (318) 357-4278. Previous articleGlobal Wildlife Celebrates the Birth of a New Baby Giraffe!